The Terror of Tiny Town is a 1938 American film produced by Jed Buell, directed by Sam Newfield, and starring Billy Curtis. It is the world's only musical Western with an all-midget cast. The film was filmed at a sound studio in Hollywood and partly at Placeritos Ranch in Placerita Canyon, California. The inspiration of the film came when Jed Buell overheard an employee jokingly say “If this economic dive keeps going, we'll be using midgets as actors”. Using a conventional Western story with an all midget cast, the filmmakers were able to showcase gags such as cowboys entering the local saloon by walking under the swinging doors, climbing into cupboards to retrieve items, and midget cowboys galloping around on Shetland ponies while roping calves. The film begins with a man on a stage who is the only cast member in the entire film who is of average height. The M.C. goes on to say that this film is the first of its kind and names it The Terror of Tiny Town. Then walks on stage the hero, Buck Larson who interrupts the emcee, telling him that the story is serious as he is the hero and will become the biggest star in Hollywood. The villain of the film, Bat Haines, comes on stage to say that he will be the biggest star in Hollywood. The two then proceed to argue and try to fight each other. The emcee breaks them up and lets the film proceed. The townspeople are at work while singing Laugh Your Troubles Away. Buck Larson's father, Pop Larson, tells Buck that he wants him to go to the ranch and find out why the calves are disappearing. Bat Haines and his gang are seen roping the calves while riding Shetland ponies. Buck spots the cattle rustlers, and they run off before he can see them up close. The rustlers plant a branding iron with the initials of a neighboring rancher, Tex Preston. Meanwhile, Bat tells Tex that the Larsons are shooting his cattle. Later Tex goes to town to retrieve his niece, Nancy Preston, who was orphaned and will now live with her uncle. In the town saloon Bat tells the sheriff to stay out of the Larson and Preston feud or he will be sent back to the jail. He also reveals that he will rob a stagecoach carrying money. While Bat and his gang try to rob the carriage, Buck and his group see the attack and run Bat Haines off. Buck is able to stop the runaway carriage that is carrying Preston's niece, Nancy. After Nancy gives Buck her thanks, Buck takes Nancy back into town. Buck and Nancy's romance continues, but they have to meet in secret due to the family feud. Nancy and Buck are discovered by Pop Larson and are forced to stay away from each other. Buck chases after Nancy and together they ride away. Bat spies on the couple and tells Tex that they are together. Tex rides to meet them and sends Nancy home. Buck convinces Tex that someone else has stolen their property. As Tex rides away he is murdered by Bat who then tries to kill Buck, but fails. Bat tells Nancy that it was Buck who shot Tex. Bat forces the sheriff to arrest Buck for Tex's murder. Buck confronts Nancy and convinces her he didn't shoot Tex, and in the process figures out that it is Bat who is causing all the problems. Buck confronts Bat in the town's saloon and punches him. The Sheriff then takes Buck into custody. Bat plans to take matters into his own hands and tries to have Buck hanged without a trial. Buck sends Nancy to the Larson ranch to round up people who will help Buck escape. As the angry mob closes in on Buck, the sheriff intervenes but is shot by Bat. Bat escapes through the window before the Larson crew arrives. Buck chases after Bat to his secret hideout. Meanwhile, the angry dance hall girl, Nita, plants dynamite in Bat's cabin. She is angry after Bat neglected and hit her. Buck and Bat engage in a final duel inside the cabin. Buck is able to run out of the cabin at the last second, leaving Bat Haines behind. The cabin blows up as Bat prepares to shoot Buck in the back of the head. Buck and Nancy are finally able to share a kiss. Jed Buell was able to find about sixty cast members for the film, with an average height of 3’8”. He found most of them through talent agencies, newspaper ads, and radio broadcasts. The film presents Jed Buell's Midgets. Many of the actors were former members of the performing troupe, Singer's Midgets., and played Munchkins in The Wizard of Oz, released in 1939. Terror of Tiny Town was released theatrically on December 1, 1938. Box office returns proved to be so well that in 1938 the producer, Jed Buell, announced in the magazine Variety, that he had closed a deal with Sol Lesser. He had plans for multiple series of sequels films featuring an all little-people cast. For unclear reasons, the sequels were never produced. The film was released on VHS by Connoisseur/Meridian on April 15, 2001. It was released on July 15, 2003 by BFS Entertainment in its DVD debut, as a part of the company's "Great Wacky Western Comedies" collection pack. It was later released by Alpha Video on February 22, 2005. Digital 1 Stop released the film on June 27th the following year, as a part of its four-disk "Cult Classics" movie collection pack. BFS would re-release the film on September 18, 2007 as a part of their four-disk "Western Value Pack". On November 6th that same year, it was released by Passport Video for their "Weird Cinema" collection pack. It was released as a single feature by Filmchest on January 24, 2012. Nearly three years later it was released by VFN on July 19, 2015. The film was last released in 2017 by Mr Fat - W Video and Film Detective on May 2nd, and June 29th respectively. 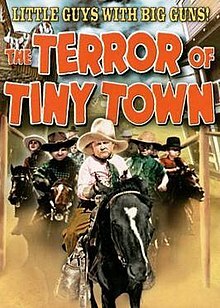 The Terror of Tiny Town received mostly negative reviews upon its release, with some considering it the worst film ever made. Author and film critic Leonard Maltin awarded the film one and a half out of four stars, calling it 'A typical, badly enacted stagebrush plot". TV Guide awarded the film one out of four stars, calling it "One of the strangest ideas ever put to film". Charles Tatum from eFilmCritic.com gave the film one out of five stars, panning the film's acting, screenplay, and musical numbers; stating that the film was "so short on entertainment". Craig Butler from Allmovie panned the film, calling it "disappointingly boring", criticizing the film's amateurish acting, unimaginative screenplay, and uninspired direction. On his website Ozus' World Movie Reviews, Dennis Schwartz awarded the film a grade C+, writing, "It holds up as a curio for those parties who are just curious to see midget cowboys in action." Film Threat noted that, although it 'wasn't a great movie', it was still fun to watch. On the film's entertainment value, the reviewer wrote, "The Terror of Tiny Town is so patently weird and spirited that it actually becomes very funny (albeit in a perverse and politically incorrect way). The midget cast isn't especially talented and a lot of the dialogue reading comes across as hilariously stilted (the fight sequences are priceless in their clumsiness – obviously stunt doubles were out of the question here). And Nita Krebs, as the Dietricheseque saloon singer, is so wildly over-the-top (or under-the-top, in her case), that her musical siren call is priceless in its warped eroticism." In 1986, the movie was featured in an episode of the Canned Film Festival. In 1980, the film was mentioned in the M*A*S*H episode "Morale Victory"; Corporal Klinger is trying to procure new movies for the 4077th, but the only one he can find is Tiny Town, mentioning the film has an all-midget cast, to which Hawkeye replies "What do we do? Show it on a pillowcase??" In 1991, Hal Ketchum used clips from the film in his Small Town Saturday Night video. ^ Thomas, Bryan. "Night Flight." 14 April 2015. web. 16 October 2015. ^ a b O'Connor, John; Rollins, Peter (2006). Hollywood's West: The American Frontier In Film, Television, And History. Professional Development Review. pp. 65–71. ^ Crouse, Richard (2003). The 100 Best movie You've Never Seen. Toronto: ECW Press. p. 212. ISBN 1550225901. ^ Kérchy, Anna and Andrea Zittlau. Exploring the Cultural History of Continental European Freak Shows and ‘Enfreakment’. New Castle: Cambridge Scholars Publishing, 2013. print. ^ "Pee-Wee's to Make Series Pictures." Variety 20 July 1938: n. pag. Web. 16 Oct. 2015. ^ "Amazon.com: Terror of Tiny Town [VHS]: Billy Curtis, Yvonne Moray, 'Little Billy' Rhodes, Billy Platt, John T. Bambury, Joseph Herbst, Charles Becker, Nita Krebs, George Ministeri, Karl 'Karchy' Kosiczky, Fern Formica, William H. O'Docharty, August Clarence Swenson, Jed Buell's Midgets, Sam Newfield: Movies & TV". Amazon.com. Amazon. Retrieved 5 April 2018. ^ "The Terror of Tiny Town (1938) - Sam Newfield". Allmovie. AllMovie. Retrieved 5 April 2018. ^ Leonard Maltin; Spencer Green; Rob Edelman (January 2010). Leonard Maltin's Classic Movie Guide. Plume. p. 664. ISBN 978-0-452-29577-3. ^ "The Terror Of Tiny Town - Movie Reviews and Movie Ratings". TV Guide.com. TV Guide. Retrieved 5 April 2018. ^ Tatum, Charles. "Movie Review - Terror of Tiny Town, The - eFilmCritic". eFilmCritic.com. Charles Tatum. Retrieved 5 April 2018. ^ Butler, Craig. "The Terror of Tiny Town (1938) - Sam Newfield". Allmovie.com. Craig Butler. Retrieved 5 April 2018. ^ Schwartz, Dennis. "terroroftinytown". Sover.net. Dennis Schwartz. Retrieved 5 April 2018. ^ "THE TERROR OF TINY TOWN (DVD)". FilmThreat.com. Film Threat. Retrieved 5 April 2018. ^ Margulies, Lee (June 10, 1986). "'Canned Film Festival' on TV, Worst of the Big Screen On Its Way". Los Angeles Times. p. 10. Retrieved December 6, 2010. This page was last edited on 2 January 2019, at 07:50 (UTC).